Bengal Presidency, Mohur, AH1209/RY37, KM# 31,Muhammadabad Banaras. 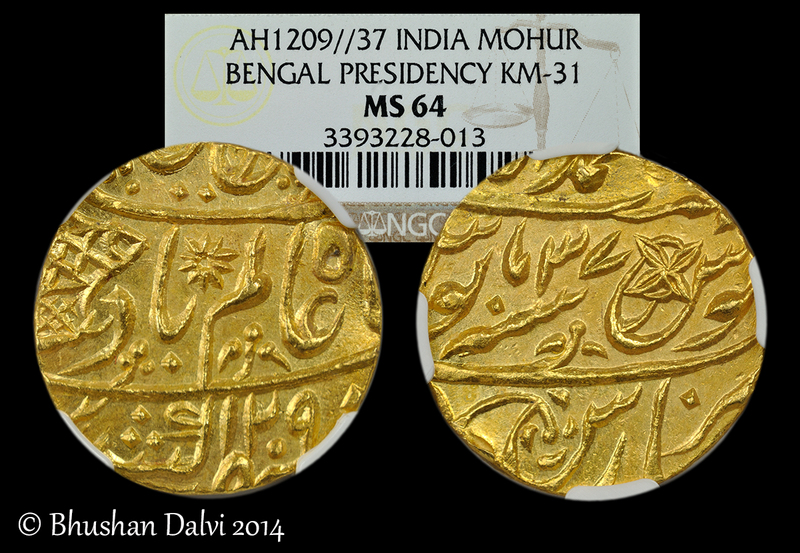 Bengal Presidency, Mohur, AH1209/RY37 (1794/95), KM# 31, Pridmore # 217, Stevens# 7.22. Mint: Muhammadabad Banaras. In name of Emperor Shah Alam II. Ex.Gardener Collection. As per Paul Stevens book on coinage of Bengal Presidency only approximately 4000 mohurs were stuck during 1794/95 based on the mint records. This number also included the 1/2 and 1/4 mohurs so the actual mintage will be lower. Dr.Stevens mentions in his new book that mint at Banaras minted very few gold coins compared to the other mints. The mohurs were not in high demand for regular commerce so only limited quantities were stuck based on the demand. I am thrilled to add this beauty to my collection in this state of preservation. Let me know what you guys think. Also do share info and pics if you have them. Re: Bengal Presidency, Mohur, AH1209/RY37, KM# 31,Muhammadabad Banaras. Bhushan - A fabulous coin! Its amazing how a few individuals such as F. Pridmore and Dr. Stevens have contribute to our hobby. Thanks for sharing the information on the mintages, I think you do have a rare one especially in the condition that it is in. Thanks Harry. It is really interesting to read Dr. Stevens notes on production of coins based on metal for each of the mints over various periods. I am considering cracking the holder and taking it out. Thoughts? In the final analysis, it is a question of personal taste. Pros include being able to hold it, getting rid of the eight sickly white lips obscuring part of the coin, being able to make a decent picture of the coin without all the scratches on the plastic and being able to integrate it in your collection. Resisted the temptation to handle the coin by cracking open the NGC holder . Leaving it inside the holder--good point about stupid thieves and traceability with the holder. Here is my specimen, similar though not the same exact type. Mine is KM-35 ( AH 1201/ 17-29). Graded MS 64 by PCGS. Beautiful specimen unnut! Good to find one with complete readable date and no problems.